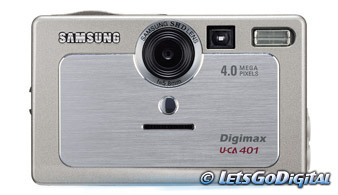 Among the whole bunch of digital cameras Samsung is introducing the new U-CA 401 is one of the ultra compact ones. Sleek, compact and ultra thin (96.7mm x 60mm x 15mm), the U-CA 401 offer all-round features into a stylish body that's small enough to take anywhere. With a resolution of 4 Megapixels and a 4x digital zoom the U-CA 401 is a camera that is easy to use and versatile for users and is interesting for those of you who are looking for a light weight camera. Although small in size, the U-CA 401 is very big on features. Beginning with its 4.1 megapixel image sensor the U-CA 401 is designed to deliver high quality images, storing them either in its internal 32MB of flash memory or onto a Sony Memory Stick Duo card. The camera can capture as many as 406 images (at the 1/3 of a megapixel setting) and up to seven images in the super fine mode at the highest resolution using the internal memory alone. As an added feature, images can be transferred from the internal memory to the Memory Stick Duo card, essentially freeing up the camera. This allows photographers to shoot without an additional card and transfer images at their leisure. The U-CA 401 also transfers images quickly and easily to a computer via the built USB interface. The camera's macro mode allows the U-CA 401 to focus on subjects as close as 6cm, while normal mode facilitates smooth, swift auto focus from 60cm to infinity. A combination mechanical and electronic shutter provides high-speed image capture up to 1/2000 of a second. A handy Night Scene mode turns the camera into a secret-agent "must have", allowing photographs to be captured in almost complete darkness. Another feature is the U-CA 401's variety of exposure controls, which provide the photographer with complete creative control over the image being shot. Photographers can chose from Program AE, Multi Metering, or Spot modes, all with adjustable exposure compensation up to ±2 stops, in .5 EV increments. The camera can capture images at selectable ISO ranges from 100 to 400. The built-in self-timer allows photographers to get into the action too, and the double exposure setting provides for some interesting creative effects. The U-CA 401 fits nicely into the palm of the photographer's hand, and offers quick and easy access to a host of controls through a few simple buttons and an easy to navigate graphical user interface (GUI). Many of the camera’s controls are accessed through the large 1.5-inch color TFT LCD screen. The built-in flash, for example, can be set to fire in Auto mode, Auto and Red-eye mode, Slow-sync mode and Fill-in mode. Sharpness and special effects can also be set on-camera via the LCD screen and GUI. The U-CA 401 allows sharpness to be adjusted from the standard Normal mode to either Soft of Vivid, while the camera can also be set to capture images with either a sepia or black and white effect. In addition to automatic white balance, the U-CA 401 also provides adjustable white balance settings for the perfect photograph. Chose from Daylight, Cloudy, Sunset, Fluorescent, Tungsten or Custom modes to capture photographs with perfect color rendition. The U-CA 401 not only captures perfect still images, but also records video at up to 30 frames per second with audio at 320x240 pixels. Movies (as well as photographs) can be played back on the built-in LCD screen, providing an on-location way to check one's directorial skills.